Captured by Captain Wolrige of the Driver, in the Bight of Benin, off the coast of Africa, 19 August 1822, with 216 male slaves on board. Printed under the direction of the Committee of the Society of Friends to aid the Abolition, 1822. 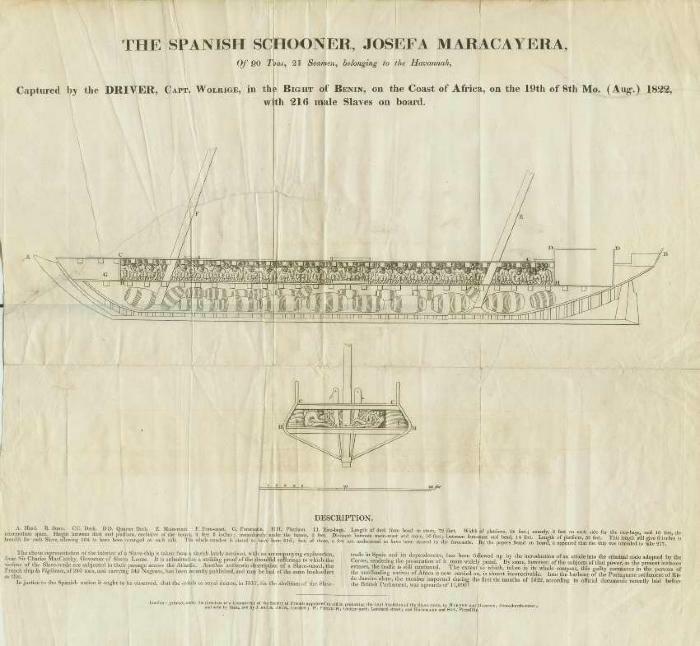 The 90-ton Spanish schooner Josefa (alias Maracayera) was captured on August 19, 1822 off the coast of Bonny by the British Royal Navy ship HMS Driver, which was patrolling off West Africa to intercept illegal slavers. The Josefa had left Havana, Cuba in April, supposedly bound for a legitimate trading voyage. The Josefa reached the West African coast on May 25th, near Sierra Leone. The crew began searching for slave-trading markets in the area but found there were too many other ships doing the same and prices for captive Africans were prohibitively high. The Josefa then sailed some 1500 miles eastward to Bonny (in present-day Nigeria) and found prices the more to their liking. Negotiations for the purchase of captives began in early July, and six weeks later, on the morning August 18th, the Josefa was loaded with 216 boys and men. The schooner sailed immediately for Cuba, but by afternoon it was spotted by the HMS Driver, and a chase began. The next morning the Josefa was captured. A print depicting the Josefa Maracayera was commissioned by the Society of Friends (Quakers) for use in their long-running effort to bring an end to the Slave Trade. The plate depicts two views of the schooner – a profile view and a cross-section – each showing the sufferings of the Africans in a space too low and small for any human. The prints were intended to be distributed as a way of bringing greater awareness to public of the many horrors of the Slave Trade. Letter from E. Gregory and Edward Fitzgerald to British Foreign Secretary George Canning, Sierra Leone, December 10, 1822.